Roof Leak Insurance Claims – Makris Law, P.A. A summer storm, windstorm, hail storm, or heavy downpour can cause your roof to leak well in advance of its expected lifetime. Depending on the type, roofs are expected to last anywhere between 20 and 50 years, typically 30 years. Storms, wind, hail, and heavy downpours all beat on your roof causing openings which allow water to enter and damage your home or property. Such damage to your roof and the ensuing water damage in your home or commercial property, are likely covered under your homeowners insurance policy, and may be covered under your commercial property insurance policy depending on the cause and your insurance coverage. Far too often, insurance companies perform inadequate investigations and prematurely conclude that the roof leak was caused by certain excluded causes in your policy. 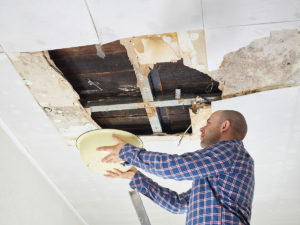 Most often, insurance companies blame the roof leak on the wear and tear and deterioration exclusions even when the roof has an expected remaining life of several years. Put simply, insurance companies assert that your roof is just old, when in fact, it may have several remaining years of expected life, but for the storm, wind, hail, heavy downpour or other weather event that caused your roof to leak. In such circumstances, we can help. We will have your roof and home or commercial property inspected by a licensed professional to get a second, more complete opinion. We will also have a licensed professional prepare an estimate of the scope and costs necessary to return your home or commercial property back to its original condition before the loss. Ultimately, we will fight for you, so you can return your house into your home again. Makris Law, P.A. is a Tampa Bay insurance claim law firm specializing in homeowners insurance claims and commercial property insurance claims, including roof leak insurance claims. If you experience damage to your home or commercial property caused by a roof leak, please contact us promptly for help. If your insurance company is delaying your roof leak claim, denied your roof leak claim, or underpaid or lowballed your roof leak claim, contact us today.